• SOME confiscated goods from Choppies Superstores Lake Road branch in Lusaka. THE National Bio-safety Authority (NBA) has confiscated assorted goods from Choppies Lake Road superstores in Lusaka worth K21, 689. The Choppies goods were not cleared for sale contrary to the NBA Act number 10 of 2007 and included Corn Flakes, instant porridge, Chilli beef soup, Chakalaka flavoured soup, Oxtail flavoured and brown onion soups. 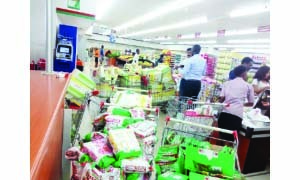 NBA senior bio-safety officer Christopher Simuntala said the action was taken after the chain store failed to comply with a directive by the authority to remove goods that did not have sales’ permits on its shelves. Mr Simuntala said a high genetically modified content was also discovered in some of the products beyond the required 0.9 per cent in the confiscated goods. “We visited the store in January to warn them to remove these products from the shelf, they did not comply and the operation was undertaken to ensure that products sold and consumed by the public were safe and met the required standard according to the country’s laws,” he said. Mr Simuntala said NBA was the only entity authorised to permit the sale of imported goods into the country but Choppies, a South African chain store overlooked the authority. He said the seized products would be burnt for the firm to realise how serious the offense committed was. Meanwhile, Set Apart General Dealers, the supplier of goods to Choppies expressed ignorance about the need to obtain the NBA clearance. Set Apart director Munji Muchimba said his firm believed that clearance certificates from the ministries’ of Health and Agriculture were documentation enough to avail the products for subsequent sale.